Rocko's Modern Life, full title Rocko's Modern Life: Spunky's Dangerous Day is a platform game that was released by Viacom on the SNES in April 1994; it's based upon the Nickelodeon cartoon of that same name (which was produced by Games Animations, who had also taken over the production for The Ren & Stimpy Show). 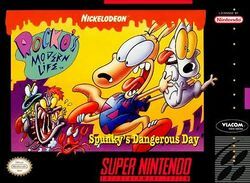 The player has to take control of the eponymous Rocko (the Australian wallaby adjusting to life in the United States), who may be invulnerable but his dog Spunky is far from it - and Rocko must guide him through sixteen stages without letting him fall into manholes or water (for it will kill him immediately), get hit by enemies (for it will drain his energy and he will also die if he ever runs out of it), and throw switches (to activate catapults that will propel him up to higher platforms) in order to reach the golden fire hydrants at the end of them. Even though Rocko can pick Spunky up in the game, he can only turn him round and put him back down again in order to reverse his direction (as opposed to being able to carry him and put him down somewhere else in the stage). This page was last edited on 9 December 2015, at 09:11.